A man has appeared in court charged with the murder of two men at a New Year's Eve party in London. Ashley Kenton - a 22-year-old DJ - and Wayne Mowatt, 29, were shot at a house in Hackney, east London, on the morning of 1 January 2002. 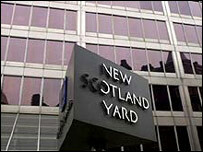 They were taken to hospital but later died of their injuries, a spokesman for Scotland Yard said. Ian Davis, 26, of Brixton, south London, was arrested following an investigation by Operation Trident, Scotland Yard's team specialising in black-on-black crime. Mr Davis appeared at Hendon Magistrates' Court on Saturday and was remanded to reappear at the same court on 29 September.